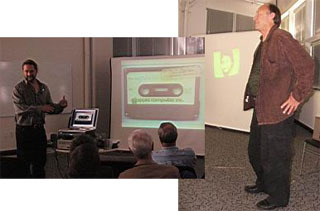 The following are the slides presented by Bruce Damer and Al Lundell at the Vintage Computer Festival 10 which give you a funny and visual history of the project. To see pictures of Bruce and Al presenting go to this page. To download the actual powerpoint file click here (53MB). To listen to the presentation click here (37 MB MP3).